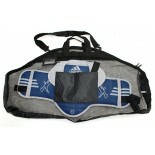 125L All Mesh Bag, Round, 21" x 37"
Black all mesh bag offers unmatched ventillation, which assists in gear drying faster. Round shape allows room for a variety of gear. 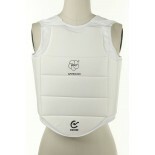 The pictured chest guard is not included. 21" x 37" ..
125M All Mesh Bag, Square, 11" x 26"
Black all mesh bag provides unmatched ventillation, which assists in gear drying faster. Round shape allows room for a variety of gear. The pictured chest guard is not included. 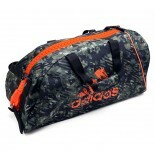 11" x 26" ..
ADIDAS MILITARY SACK Polyester material with solar orange accents. Zippered compartment on the exterior contains a mesh pocket. No additional pockets inside, but there is ample room within the main compartment. 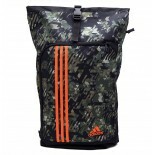 The Adidas Military Sack has a zipper closure on top, with an additional clip closure on the outside. Strap features a zipper which allows it to be worn as a back pack or a cross body back pack. Dimension.. COMBAT CAMO BAG, M Great for storing a variety of gear, this unique bag is made of an ultra-durable polyester material. This abrasian-resistant 'PES' (polyester) material, which covers the bottom and sides of the bag, mitigates damage and is easy to clean. Features adjustable dual straps, nylon handle, and an oversized orange zipper to open the main compartment. Printed Adidas logo, with 3 stripes on opposite side. .. COMBAT CAMO BAG, L Great for storing a variety of gear, this unique bag is made of an ultra-durable polyester material. This abrasian-resistant 'PES' material, which covers the bottom and sides of the bag, mitigates damage and is easy to clean. Features adjustable dual straps, nylon handle, and an oversized orange zipper to open the main compartment. Printed Adidas logo, with 3 stripes on opposite side. 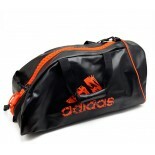 Dimen..
ADIDAS BLACK "2 IN 1" BAG, M Great for storing a variety of gear, this bag is made of durable polyurethane. Designed to allow conversion from carrying bag to backpack, using two shoulder straps stowed inside the bag. Also features durable nylon handles, oversized orange zipper to open bag, and special 'angle cut' on one side. 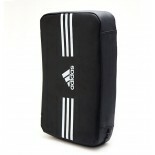 Dimensions: 24" x 12" x 10" ..
ADIDAS BLACK "2 IN 1" BAG, L Great for storing a variety of gear, this bag is made of durable polyurethane. Designed to allow conversion from carrying bag to backpack, using two shoulder straps stowed inside the bag. Also features durable nylon handles, oversized orange zipper to open bag, and special 'angle cut' on one side. Dimensions: 28" x 13" x 12" ..
ADIDAS HAND KICK PAD (16.5x9.5x3.5) This kick pad contains a dense foam interior with a durable vinyl exterior. Quality construction and materials, along with a curved surface design, help promote maximum shock absorption. Features two reinforced grip bars for easy handling. 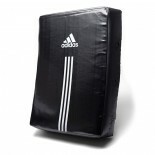 ..
adidas STRIKING PAD (24X20X5.5) Very durable polyurethane cover. Curved design and dense foam interior allows this striking pad to absorb and easily dissipate significant blows. Impressive impact absorption preserves both trainer and athlete. Great for training powerful strikes. 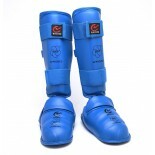 Offers a variety of holding positions for easier handling. Features two vertically aligned grip bars, and a horizontal grip bar to be utiliz.. 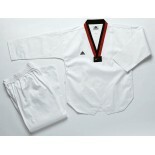 Designed for students and beginners who prefer a light weight uniform. Affordable starter uniform utilizes a twilled poly-cotton fabric. 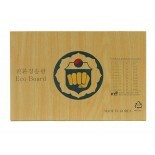 World Taekwondo Federation Logo Size: 5, 6, 7, 8 ..
Eco demo board refrains from using wood and is environmentally friendly. 1/5" thick .. Plastic Escrima Durable plastic. Yellow & Black spiral. Length: 26" Diameter: .875" ..